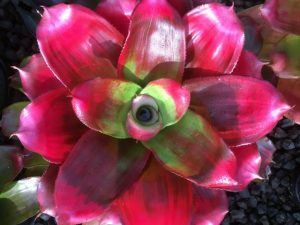 Light:- This is the most critical factor to consider for most Bromeliads; some are quite specific in their light requirements and other species and cultivars can be successfully cultivated in a range of light regimes. For many plants (e.g. Neoregelias) inadequate light results in poor colour and undesirable plant structure with elongated weak leaves. Excessive light for some Bromeliads (e.g. Guzmania) causes scorching of the foliage which if extreme can result in death of the plant. The light regime considered optimum for these plants can vary considerably within Australia because the overall ambient conditions can be quite diverse. If information is not readily available on the preferred light regime for a particular plant some rules of thumb may be useful but unfortunately these generalizations do not always apply. Plants with grey, silver or bluish leaves are able to reflect the suns rays and can probably tolerate full sun. Red, pink and purple colours are attributable to the presence of pigments called anthocyanins in tissue and act as sun block for tropical plants. Plants with these colours usually perform well in bright light if not full sun. Sun loving species usually have stiff thick leaves whereas shade loving species such as Guzmania spp. usually have thinner softer leaves. Temperature and available moisture:- Many plants are tolerant of a wide variation in temperature; others in particular coastal species are not so tolerant. 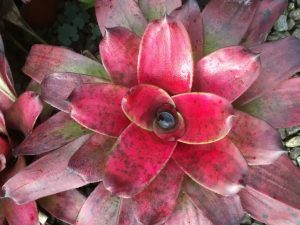 Some Bromeliads are tolerant of low temperatures (i.e. near 0 Celsius) but only for a brief period of time. Both excessive heat and cold can cause irreversible damage to plants. Plants severely damaged by excessive heat or cold usually become quickly infected with a fungal organism called Cladosporum which results in collapse of tissue. Water preferences vary considerably between and within genera. As a generalization the tank Bromeliads require less frequent watering than those unable to store water. Excess water renders plants more susceptible to diseases both fungal and bacterial. Inadequate water for prolonged periods results in shrinkage of tissue and eventually necrosis of part or all of the plant. Sometimes plants suffering from dehydration can be revived with a generous soaking. Media, Nutrition etc. Plants in Bromeliaceae can be categorized in one or more of the following categories:- Terrestrial, Naturally grow in soil Epiphytes, Grow on living trees or other plants Saprophytes, grow on dead timber Lithophytes (saxicolous), grow on rocks From the gardeners perspective the plants in the later three categories are grouped and generally referred to and treated as epiphytes. With appropriate cultural practices most epiphytes can be grown successfully as terrestrials or in containers. The strictly terrestrial species and cultivars can not be successfully grown as epiphytes. Epiphytic species need ample air around their roots and if grown as terrestrial or container plants should be planted in a media or substrate with at least 20% air filled porosity. The media should be adjusted if necessary to a pH that is neutral to slightly acidic (6 to 7). Epiphytic species generally perform best when fertilised with a slow release fertilise which has a higher percentage of Potassium than Nitrogen. Most epiphytes have the ability to absorb nutrients into the leaves through the scale-like trichomes; liquid applications of foliar fertilisers at low dilution rates usually enhance growth and colour. Terrestrial species generally require less air in the root zone. The preferred pH for terrestrial species varies considerably. In nature members of the genus Ananas (Pineapples) grow in acidic conditions with a pH as of approximately 5. Cryptanthus and Guzmania prefer a pH closer to neutral of approximately 6. 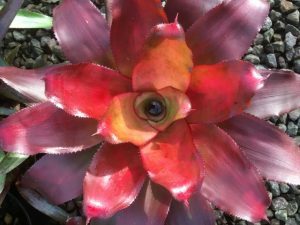 Not all terrestrial Bromeliads are able to absorb nutrients through the foliage; however applications of a diluted soluble fertiliser to the root zone are usually beneficial. 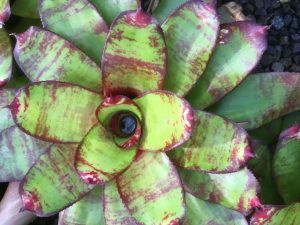 Plants from the family Bromeliaceae have infinite potential in the created landscape; the main limiting factor being the imagination of gardeners both amateur and professional.